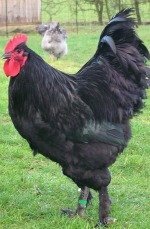 The Langshan is an Asiatic breed of chicken that is tall and a good dual purpose bird that lays brown eggs. Size: Standard Male: 9.5 Ibs. / Standard Female: 7.5 Ibs / Bantam Male: 36 oz. / Bantam Female: 32 oz. Comb, Wattles & Earlobes: They have a single comb with five well-defined upright points which is medium sized in males and small in females. The wattles are well rounded and medium in size. The earlobes are moderately large and all are bright red. Color: The eyes are dark brown in all varieties. Black: The beak is dark horn with shading to pinkish horn at the tip. The shanks and toes are bluish black with a pinkish tinge between scales and pinkish white bottoms to the feet. They have standard black plumage. Blue: The beak is dark horn which shades to pinkish white at the tip. The shanks and toes are bluish slate with a pinkish tinge between scales and pinkish white bottoms to the feet. They have standard blue plumage. White: The beak is slaty blue that shades to pinkish white. The shanks and toes are bluish slate with a pinkish tinge between scales and pinkish white bottoms to the feet. They have standard white plumage. Special Qualities: A good dual purpose bird that lays brown eggs. They are graceful and stately. The Langshan is 1:05 into the video. This is a very old breed from China. 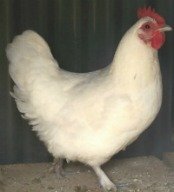 They were originally thought to be a variety of Cochin, but they come from different areas and differ in some breed characteristics. For instance, the Langshans have black legs with pink skin while the Cochin is yellow to yellow. They also weigh less than Cochins, but stand much taller, registering as one of the tallest non-game breeds. The breed came to England in 1872 and made its way to North America in 1876. They are also quite ornamental for a dual purpose bird, thanks to their height, as well as their lustrous coloring and very long full tails. These birds are adaptable to confinement or free range, are slow to mature, cold hardy, and active, yet docile to their handlers. The hens are good mothers who will go broody and lay a pretty good amount of all dark brown eggs. This breed was first recognized by the APA in 1883.